We flew from Bangkok to Munich just in time to stroll through Christmas markets, drink mulled wine, savor brats and marvel at the lights. A box of winter clothes, packed back in August, awaited our arrival and we were gleeful at the sight of old jeans and our woolie hats. 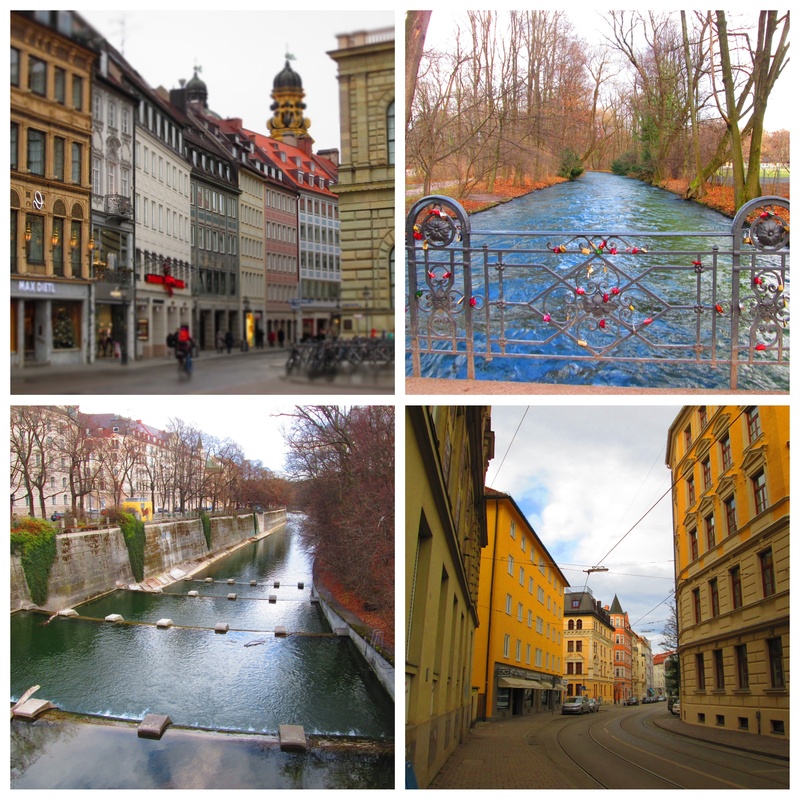 After months of the sultry heat, vibrant color and the chaos of SE Asia, the calm order of Munich with its soft blue sky and rows of decorative pastel buildings felt meditative. 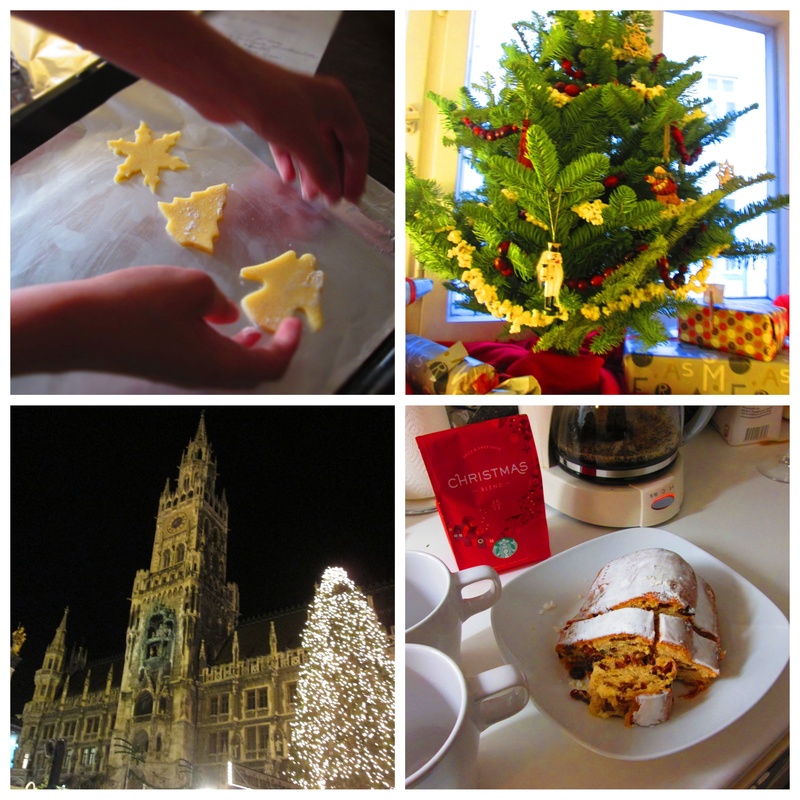 The Christmas markets were just beautiful…gingerbread, ornaments, orange-cinnamon potpourri, mulled wine, spiced nuts…it was a delicious meander. The gothic “new” Town Hall stands proud above the Marienplatz awakening the historian in me. 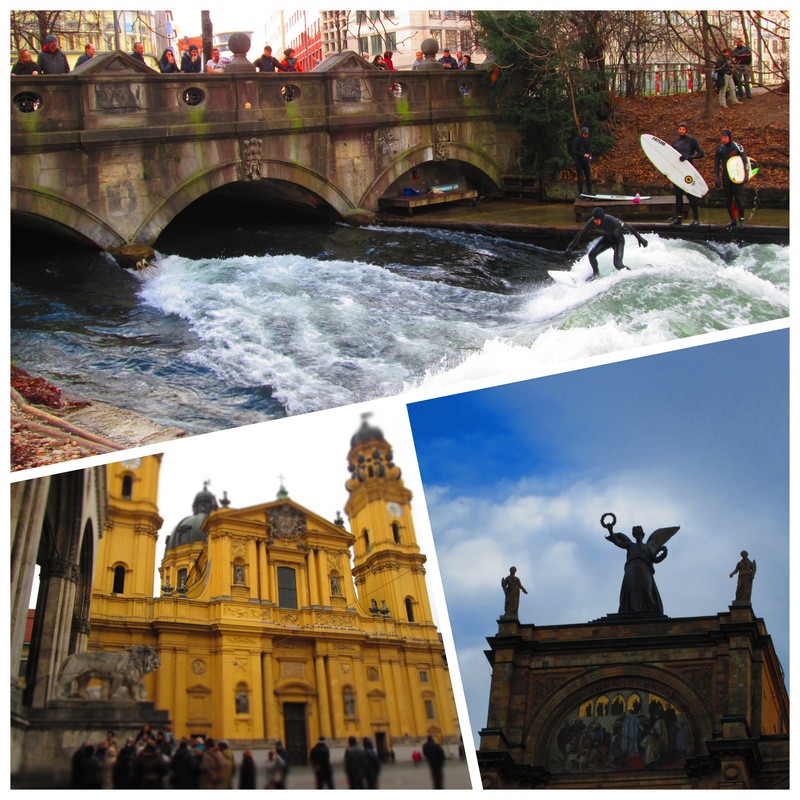 Imagine the surprise our first day when we stumbled upon Bavarians in wetsuits surfing the Isar River, steps from our apartment. Or the modern-museum-quality street art. Or the angels looking over me from tall buildings everywhere we went. Christmas was low key perfection. We found a tree slightly larger than Charlie Brown’s. Decorated it with ornaments found at the Christmas markets and strings of popcorn and hard sought cranberries. Kyle made the traditional German Christmas Eve dinner of sausages and potatoes. We were joined by a sweet rtw family from Florida who rounded out our meal with a beautiful Christmas salad, and we swapped stories about our adventures. Of course, we had a German stollen for dessert…which looked dangerously close to a fruitcake but was actually quite delicious. Church bells rang throughout the day, reminding us that we hadn’t just downsized to a NYC apartment but were actually in Europe. It took quite an effort to make our standard Christmas cookies…we painstakingly but eventually found most of our ingredients, not all. A mid-aisle discussion with locals led us to believe that Germans don’t use baking soda. When getting ready to roll the cookie dough, I realized there was no rolling pin in our apartment. 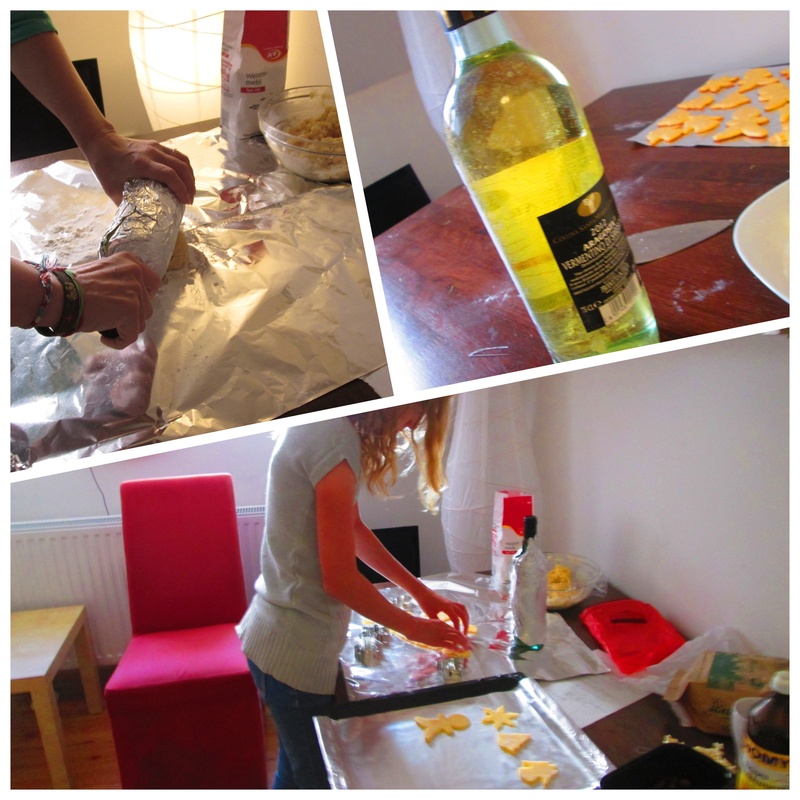 At long last, years of reality TV paid off…I used a cold bottle of white wine instead…thank you, Top Chef! On Christmas Day, we quickly worked through the meager presents and moved onto a breakfast of French toast and Starbucks Christmas Blend. 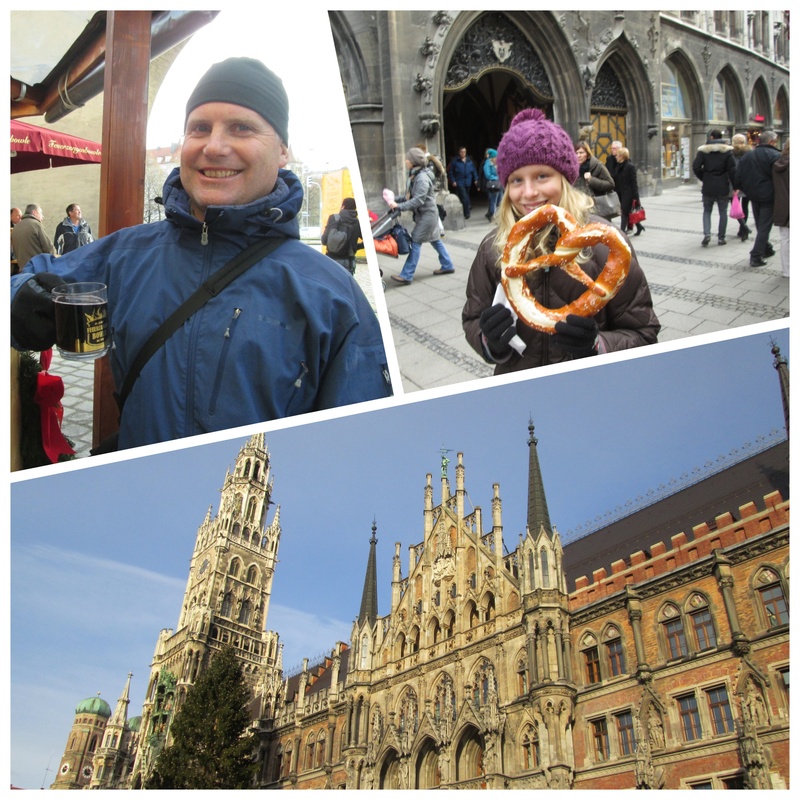 We stumbled onto the streets of Munich for a Christmas walk in sunny blue sky weather with many other Munchner. 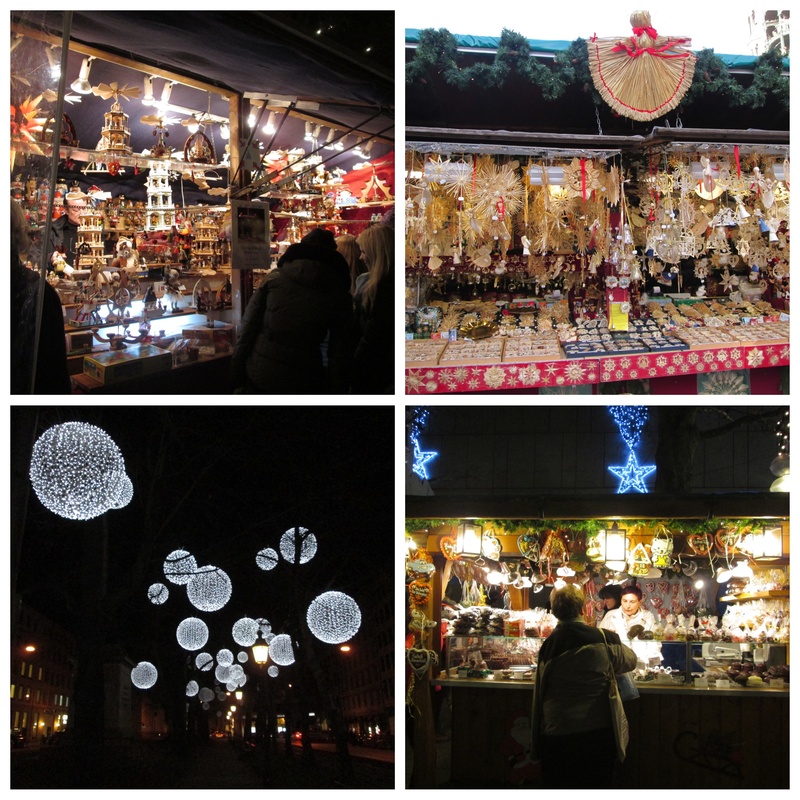 A walk through the English Gardens brought us to an open Christmas market and we drank mulled wine and munched on spiced nuts. It’s funny how some of our destinations have required a month of hard effort to enjoy while others slip on like a comfortable skin. Happy New Year, everyone! Thank you for following along with us in our adventure! Wishing you adventure and serendipity in 2014.